In life, sometimes change is really hard. It is very difficult for us as human beings to accept any little deviance in anything we do. I remember as a child seeing how upset my parents became when the local newspaper made a simple change to the layout and font of the paper. It was one little, seemingly insignificant change that appeared to have ruined their day. It was at that young age I learned that early lesson, and as I’ve gone through life I have been able to see it in action in many ways. When it comes to the world of consumer retail and digital pianos, the case is certainly no different. Sometimes it becomes very hard for consumers to accept a newcomer or a brand with no reputation or relatively unknown name. 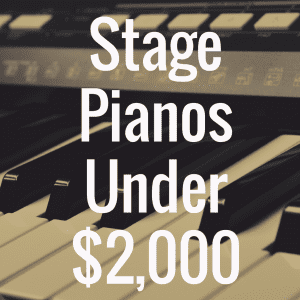 There are many dependable brands out there on the digital piano market, and many times even if it means a couple more bucks, consumers are willing to shell out the extra cash in confidence of the name. This can sometimes work in favor of the product, and sometimes it can work heartily against it. Below, please enjoy the interactive guide that was created to make your piano purchase easier. Compare the extremely affordable Huntington KB-61 to the best pianos in its class based on weight, price, and even customer reviews from Amazon.com. Such is the climate concerning the Huntington KB61-100. Huntington is a relatively unknown producer of musical instruments, most of them being decent drum sets, keyboards/digital pianos, or guitars. Even if you take out some time to search the internet for their company or website, you really won’t come up with much. I am not sure exactly what to think about that, as that could be for a number of reasons. It could be negative, in that the company does not have much reputability and doesn’t want the consumer to have any point of contact. Or it could be negligent in that Huntington is simply a subsidiary of a larger company. Whatever the case may be, the products they produce seem to be just fine. Keeping it completely honest, the KB61-100 is a cheap piano. But that shouldn’t be something that scares you away. It is this very characteristic that draws many people to buy this very machine. It is one of the better selling products on Amazon.com. 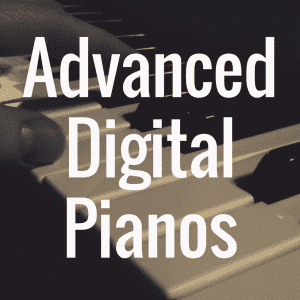 It is one of the better options for a digital piano online as the consumer knows upfront what he is getting and isn’t being duped at all. It is able to provide the basic needs of the piano player while offering a variety of selections. The design of this digital keyboard piano is simplistic and reasonable. At first glance you won’t be wowed by the keyboard’s presence or any striking beauty brought on by fancy features or high end material. You’re going to get your basic plastic casing, or box structure, with two good sized speakers set in opposite ends of the piano. The KB61 comes with a matching music rest that is perfect for beginning piano players looking for a place to rest their recital or learning material. If you’re not satisfied with the original silver finish, you can always find a different model with a professional black finish. As its name states, the piano has 61 keys which are light to the touch and not weighted, perfect for beginner pianists, in that they aren’t overwhelmed with a wide range of notes and can easily access any key or button located on the machine. The control interface is well notated, as there are 100 different voices and tones to choose from, as well as 100 different rhythms to select. There is also an LED display screen which helps tell different functions such as tempo, transpose range, and volume. Even though it only has 61 keys this piano certainly is no mini keyboard, and it has a pretty good size to it. The piano is 40 inches long, 18 inches wide, and weighs in at a surprising 18 pounds, which is certainly on the heavy side for a smaller range piano. 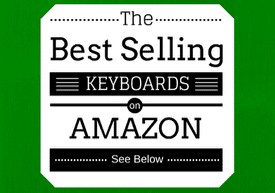 For a digital keyboard that has such a low cost, it is surprising that there is such a large amount of variety and selection when it comes to the tones and rhythms on the machine. The KB61 comes with 100 different voices, ranging from different grand piano and electric piano sounds, to basses, woodwinds, brass, strings, and sound effects. The sounds are not the greatest in the world, but that certainly is to be expected when buying a keyboard for less than a hundred dollars. However, for any beginning piano player it is sure to get the job done. 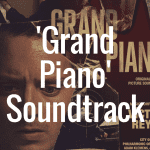 There are also 100 different rhythms present on the piano, and these range from modern pop beats to classic bossa nova rhythm styles. Having rhythms present on any kind of teacher or learning piano is really a great feature to have, as it helps young piano players learn how to keep a beat and gain a better understanding for how to keep up in a performance. 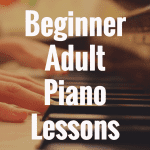 It allows them to graduate from a beginner level of feeling their way through a piece at their own pace to challenging themselves at a much faster level. In addition to the rhythms are a number of different accompaniment options, as the KB61 comes with eight stereo demo songs, which are another wonderful tool for helping young pianists learn how the instrument is played. There are also 32 different tempo settings, so you can always slow the song down to a pace you can handle. 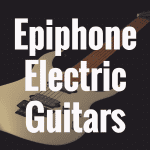 Each song has A and B guides, along with start/stop functions with fill-ins and other features. The KB61 unfortunately does not come with too many special effects, but if you are a beginning piano player chances are you will want to focus on more of the basics anyways. There aren’t any reverb or chorus effects that can be applied to the tones, and there are no dual or split functions. There is, however, a transpose function, which will help beginners change the key of whatever they are playing into something more comfortable. The KB61 also does not have any MIDI input or output, and there certainly is no USB connection. Thankfully, this piano does have a quarter inch output jack that you can use to line into other devices for recording purposes, and stereo RCA output jacks. Overall, this piano is one of the better bargains you will find on the Internet, and for less than $70 you really can’t go wrong. But just in case you need to see more of this piano to get a feel for it, be sure to check out the YouTube video overview of the KB61-100 below! 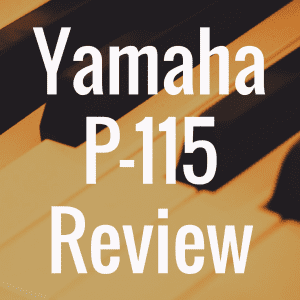 For more great piano reviews, be sure to return to our website! 4) Digital Pianos vs Keyboards: What’s the Difference?